Next post: Better Than Flarf? Unfortunately, the video is gone, but this old news is worth noting: What Will You Do With the Mad in You? We’re off school for the week. A friend left his better-car-than-mine for me to take on road trips upstate & escape the city, but instead, I find myself thinking about things at home. I’ve already taken a walk with the dog on this lovely balmy 40 degree day. Now I’m also making lazy attempts at writing and am here actively avoiding the work that needs to get done. On in the background has been Charlie Rose, and now, Mr. Rogers educates the planet. On Rose, Michael Crichton explained why global warming isn’t really happening – whew. I’m glad he cleared that up. When I was in the fourth grade, Mrs. Creighton overheard me calling Mr. Rogers a sissy. She called me over and explained to me, firmly, why my remark was ignorant, misinformed, and a raw example of a stereotype. I walked away from that chat trying to suppress tears, not because I truly understood why I was wrong, but moreover, because I had disappointed Mrs. Creighton, who was, not so incidentally, the only African American teacher I had until I left for Baltimore at 15. I remember admiring her stern, strong character as a child, though in retrospect, I can only imagine what it must have been like to be the only (I’m fairly certain) non-white teacher at Stone Mill Elementary. Anyway, I never really did like Mr. Rogers’s show as a child. I thought it was too slow and full of obvious, boring lessons. I’ve watched his show plenty of times as an adult and knew someone who used to do the sets. She told me that he really was as kind as his t.v. persona and that she loved her job. My opinion has altered considerably, now that I have the patience of an adult (sort of). This show was made for adults. True, Fred Rogers presented lessons that were obvious about whatever the topic of the day may be, but moreover, his show exemplifies the in’s and out’s of navigating and enjoying community. With his numerous walk-on guests/visitors that included a range from scientists, sports players, jazz musicians, etc., as well as his standard puppet friends, we are privy to conversation after conversation that aims to teach common sense and how to deal with misunderstandings. People/puppets become frustrated, depressed, or stressed out at worst, but no one ever comes close to blows or anywhere near the line of aggression. We witness these characters making concessions, being generous, and inquiring in the face of curiousity or confusion. Best of all, emotions are never disregarded or suppressed; they are acknowledged and worked through, sometimes not so easily. I’m a simple person. And I like Mr. Rogers now – may his legacy make its way into the hearts of more adults. 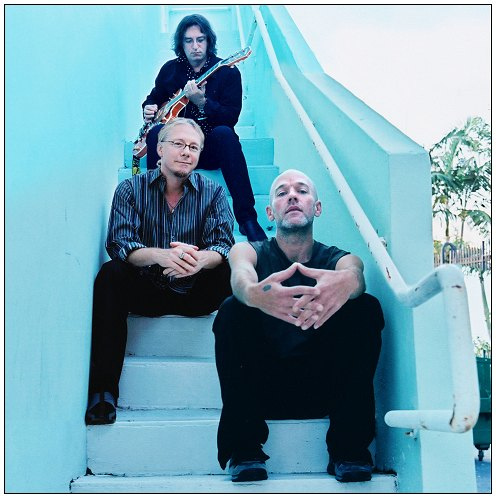 After said television time, I find this to be an R.E.M. kind of day, old skool. How you gonna kick it: Talk About the Passion or Andy Kaufman, yeah yeah yeah? The Decemberists also do a nice rendition of one of my fave REM songs, Cuyahoga (I couldn’t find REM online doing it). This entry was posted on Tuesday, February 20th, 2007 at 8:36 pm	and is filed under Music, Politics, Teaching. February 21st, 2007 at 12:53 am eListen to Cuyahoga here. February 21st, 2007 at 1:11 am eIt’s obvious why Ashok has you on his list of friends. Love your tale about Mr. Rogers; my son would cry everytime Mr. Rogers left, and had to be reassured that he would return the next day or Monday. I watched it with my son, and although your thoughts about the program are true, to most children, he respresented many of the things that were not evident in their “real world” and for which they yearned. Best Wishes, O friend of Ashok. February 21st, 2007 at 1:14 am eAlso, I see you live on “Long Island” – I’m originally from Rosedale, Queens, and most of my remaining siblings live on Long Island. I retired from Raritan Valley Community College in 2000 to live in Western, NC. February 21st, 2007 at 2:52 am eOne of my fondest memories in my life came from my freshman year at UCLA. The school arranged for many midday informal visits from artists and intellectuals and scholars, popular or otherwise, and one day Mr. Rogers visited. I recall the event was held at Ackerman Union. Many in the audience were adults with children. When Mr. Rogers took the stage, the children, without prompting or an invitation, all went directly to the foot of the stage and stared up at the man. He leaned down and greeted them, and they responded with awe and reverence. He was large! He was tall! He was out of the television! They could not have looked more astounded than if he had sprouted wings and took flight. He excused himself from the quiet chat with the kids, suggested gently that they take a seat so he could speak to everyone, and he began speaking with intelligence, wit, and concern about child psychology, education, television, and parenting. I have no memory of watching his program when I was a child, and I happened upon that event by accident; I was looking for a seat to catch up on some reading between classes (William Carlos Williams if memory serves). That day I met a beautiful man, a man of unique and radiating kindness, one who taught me not to confuse a gentle nature with weakness. He cared tremendously for children, and for the future they would walk in. It’s a little odd even now to write this about Fred Rogers because of the impression most have of him from the easy caricatures that abound. But what a good person he was. I still recall how saddened I was by his death because he was “about” something eternal yet vanishing…sweetness, kindness, and a life committed to caring. Oh, and today was a good day for old R.E.M. Even though I love the song “Bad Day,” it was a good one after all. It was almost like spring. February 21st, 2007 at 5:48 am eHeh…I made fun of Mr. Rogers early on. the Lao Tzu, Chuang Tzu, and Heaney. We all need to be human. Oddly enough, especially when life hurts. Better late than never. He knows what’s going on in the child in us. realize just how massively insightful he was, and we are sometimes not. That was well put, Amy. February 21st, 2007 at 1:57 pm eFrances – thanks for the mp3 link! Joe Hagarty, Artist – I’m glad your son loved him. I felt fairly alone as a child in my boredom with his show; most kids at my nursery school were similarly enthralled. And very cool that you do sketches of people! I’m going to see if I can muster something up and send it along! Tim — What a lovely story. And what a great introduction to Fred Rogers, esp since you hadn’t even planned it (& in lieu of poetry!). Thanks very much for sharing it. I love that there are so many consistent stories about his character all over the internet. Accordingly, this is the most key note here I think, “…one who taught me not to confuse a gentle nature with weakness. ” Thanks, Tim! and that you love them and you’re looking out for them now. to know you’re needed and you belong (as I noticed). That helps bring you back from your anxiety. Kids you know as well, of course: relatives, friends. February 21st, 2007 at 8:09 pm eI have the big 33-1/3 EP for “Don’t Go Back To Rockville”. not cramming tracks on the vinyl. Like that 45 rpm / juke sound. Mixed like it was recorded in some hollow room…awesome. February 21st, 2007 at 8:15 pm eI enjoyed Mr. Rogers when I was really, really young – he had Andre Watts on this one show to play one of Schubert’s “Moment Musical” pieces and Chopin’s “Revolution” Etude, and god, it was a thrill about a year ago to see Andre Watts in concert and think about Mr. Rogers – and I probably would watch him now if I could. I just wish his ability to appreciate what people are was something I had during my teenage years. It was easy to be cynical then. February 21st, 2007 at 8:29 pm eI say awesome too much today…sorry, lol. calling vocals with Snow Patrol’s “Chocolate”. The harmony, the echoes; the beat, though slowed a bit. February 22nd, 2007 at 11:26 pm eWhen I was a kid, urban-legend had it that Fred Rogers was a decorated sniper and that he had to wear long sleeves at all times while on the show because his arms were covered with tattoos that he had aquired during his tour of ‘nam — he had one tattoo to honor each person that he had killed. say he did. The sniper rumor is, strangely, the most popular. to serve in the Forces. The tatoos are a pretty fancy embellishment, heh.. Sometimes a cardigan is just a cardigan..
Mr. Rogers, a sniper? While I was spellbound reading Mia Mia Mia Mia Mia Mia Mia Mia Mia Mia’s comment, I have to shoot it down, because he’s just to good a person to besmirch postmortem with rumors such as this. 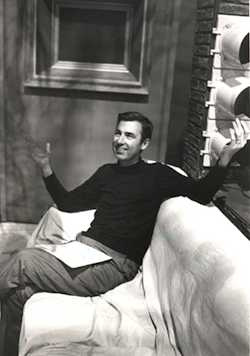 Fred Rogers is my homey. I found another link to the video. Thanks for pointing out that the old one was taken down.